The new year started off with a consultation with Alice Tracey, RMT. Alice decided she needed to revamp her website with new images of her clinic and some new head shots. We discussed what she was looking for, when was the best light in her clinic and what colours she truly thought expressed her. Given Alice’s line of work, it wouldn’t have made sense to have her dress in a suit or dress, she is perfectly and professionally at ease in a gorgeous t-shirt and yoga pants. Being an RMT is not an easy job, so Alice needs to be able to move comfortably while performing treatments. January can be hit or miss for bright days, and we had experienced enough dark clouds and cold temperatures for this winter season so we looked ahead in the forecast and picked a date that was scheduled to be bright and sunny and it didn’t disappoint. Alice had recently repainted her clinic and the colours she chose were calming and welcoming. The yellow in the waiting area is perfect and the soft blue in the massage room is one of my favorites. A lovely and welcome area to enjoy a tea or a glass of water before or after your treatment. This room speaks to me, with the calming blue, the beautiful painting, a faux fireplace and little extra touches that give you a sense of calm. The bright frosted window allows for some light if you want it as well as privacy from the outside. A truly enjoyable room for whichever treatment you are receiving. All the items in the room represent something and it is lovely to hear Alice explain some of the different meanings and what they represent to her. 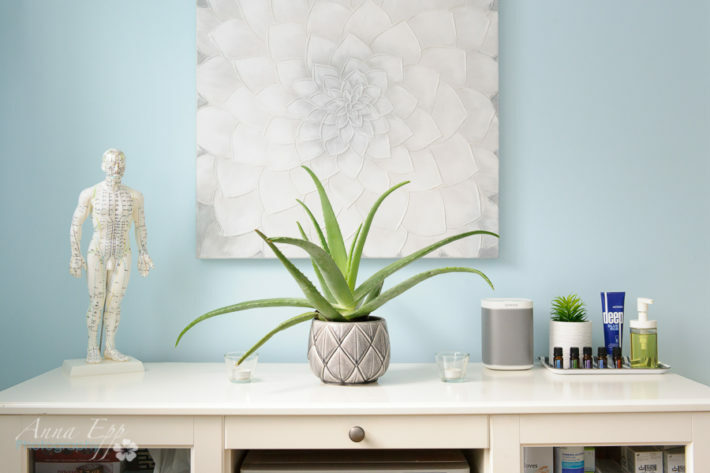 I loved the crystals, aloe plant and the yoga pillow, so much so that they deserved a little extra attention from me. Looking forward to seeing the website when it is up and running, for now, to book an appointment with Alice, go to her current website and schedule some time for you. I also wanted to give a little shout out to Ladies Who Lunch Ottawa and Call Betty!’s Catherine Landry, who unbeknownst to her, put Alice and I on a path together. Catherine and I have worked together several times on a few fabulous events that Call Betty! has put together and it is always a pleasure to work with Catherine and see what amazing things she will put together.